NIGHTSATAN Deliver Two Minutes Of Madness In Absolutely Gonzo New Proof Of Concept Trailer! All hail our new synthesizer overlords in Nightsatan! 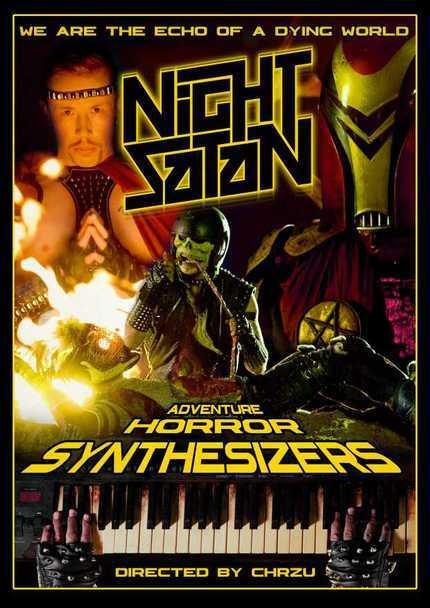 It was just a few weeks ago that we shared the short film Nightsatan And The Loops Of Doom from director CHRZU and featuring the actual Finnish synthesizer band as themselves in a stupendously odd vision of a post apocalyptic future. But as weird as that short film is (which is very) it doesn't even hold a candle to the brain melting madness that is the brand new proof of concept trailer for the upcoming Nightsatan feature film. This thing may only run two minutes, but what a two minutes. Cannibalizism, techno witches, digital zombies, battle mecha constructed out of autonomous speakers ... there's more madness per minute here than should be legally allowed and it's all absolutely brilliant. This is, as mentioned, a proof of concept for a feature film that has just launched a crowdfunding campaign here and I do recommend that you throw a few bucks into the pot after watching the trailer and the pitch videos below. I already have. Support the crowd funding here. Clearly CHRZU the Finnish spiritual cousins to the TurboKid folks.